A mountain view comes with your campsite on a grassy meadow east of Cody. 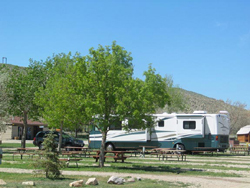 This KOA makes it easy to visit area attractions. A shuttle runs to the Cody Nite Rodeo every summer evening. On-site recreation for the entire family including family swimming pool complex, free Wi-Fi, kid-friendly playground complete with a junior climbing wall, game room, off-leash dog playground, jumping pillow, giant checkers and chess set, basketball courts and horseshoe pits, bike rentals, and planned activities. Open May-October. Pets welcome.